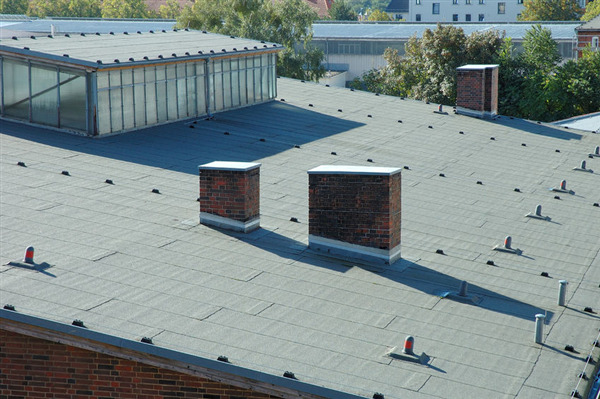 There are different installation methods for a variety of flat roof styles. Perhaps the most well known style is to unroll a membrane, or possibly a sheet of rubber, across the roof to form an absolute barrier. Any roof penetrations such as chimney or exhaust vents for air or plumbing are individually sealed with a roofing tat or a tar substitute. Typically, the membrane is then anchored with a layer of smooth gravel. Like every other component in the building, the flat roof does require occasional maintenance. It is generally more durable than a pitched roof with shingles, but similarly the roofing tar needs to be replaced from time to time. Further, the weather and outdoor conditions can lead to the gravel becoming misaligned, so it may need to be spread back out evenly. Of course, everything has a breaking point so the membrane may need to be patched, although this is a rare occurrence and usually only the result of a specific event. The roof is designed to last for decades under any weather condition, but you have to remember it’s still in an outdoor setting and will eventually wear out, requiring roof replacement. When this happens, it’s important to remember how important of an investment it is and take the time to have it replaced properly. You’ll want to consider what new roofing technologies have taken place since the original roof was built, as there are likely more efficient and economical solutions suitable for the building than what was available during the initial construction. Be sure to discuss with your contractor what your options are, and voice to him whether you want to address environmental issues, low cost, low maintenance, or the longest life for the new roof. « Why Choose a Duro-Last Roofer?